Soybean (Glycine max. L.) is a major legume crop grown for its protein- and oil-rich seeds but it also makes valuable forage for grazing, silage and hay. Soybean is a fast growing herbaceous annual native to Asia that is currently grown worldwide. It is an erect leguminous plant, which grows up to a height of 1.3 m. Its taproot can extend to a depth of 2 m in good soil conditions, with secondary roots exploring the upper 15-20 cm of the soil. Roots bear nodules usually resulting from the presence of Bradyrhizobium japonicum. The leaves are trifoliate and the leaflets are oval to lanceolate, mostly broad in commercial cultivars (Ecoport, 2010). The flowers are papilionaceous and white, pink, purple or bluish in colour, with a 5 to 7 mm long corolla (Giller et al., 2007). The fruits consist of 2 or 3 pods containing yellow, rounded seeds with a hilum colour ranging from yellow to black (Koivisto, 2006). Soybean varieties bred for forage are late maturing and taller (90-130 cm high) than grain varieties (Doo-Hong Min, 2012; Sheaffer et al., 2001). Forage soybean has indeterminate growth. It is stemmier and produces more biomass than grain varieties. Forage soybean has a delayed maturity which is favourable to fodder quality (Snavely, 2012). Genetically modified forage soybean has been developed (Doo-Hong Min, 2012; Snavely, 2012). Like other forage legumes, soybean forage has many valuable traits as fodder. Soybean leaves and stems can be grazed, ensiled or dried to make hay. The foliage is very palatable to cattle, and has a high nutritive value and good digestibility (Koivisto, 2006). Soybean forage is much valued in wildlife management as it is also palatable to deers (Snavely, 2012). In the USA, before 1935 soybean used to be grown mostly for fodder, but after this date its value as an oilseed and protein crop started to outweigh its value as forage. However, there is a resurgence of interest in soybean forage whenever the economic returns of soybean grain decrease, for instance after drought or frost (Morse et al., 1952; Sheaffer et al., 2001; Wright, 2013). Nowadays, the most commonly used soybeans forage are grain harvest by-products. The stubble, which is the residue of the crop that remains on the fields after bean harvest, can be cut and chopped to feed dairy cows and heifers (Fluharty, 2009). Soybean straw, which is the residue of threshing of the beans, can be used as a source of roughage for cattle (Sruamsiri, 2007). Soybean is native to Asia. It was domesticated in northern China 3000 years ago and is now grown worldwide between 53°N and 53°S, and from sea level up to an altitude of 2000 m. The main producing countries are the USA, Brazil, Argentina, China and India. 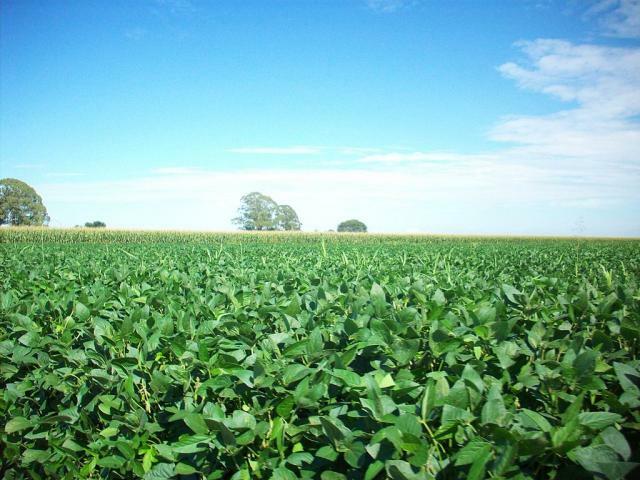 In the USA, soybean was initially introduced in the mid-1800s for forage production (Williams, 1897), with 63% of the soybean crop area being intended for forage in the 1930s. However, as it became more profitable to grow soybean for protein and oil, forage production declined rapidly, from 21% of the area grown in 1941 to only 10% in 1948 (Morse et al., 1950). Optimal growing conditions are obtained when average day-temperatures are around 30°C, annual rainfall is 850 mm, and not less than 500 mm, and water is available during the growing season. Forage soybean thrives in well-drained soils with a pH ranging from 5.5 to 7.5. Soybean is sensitive to soil acidity and aluminium toxicity. 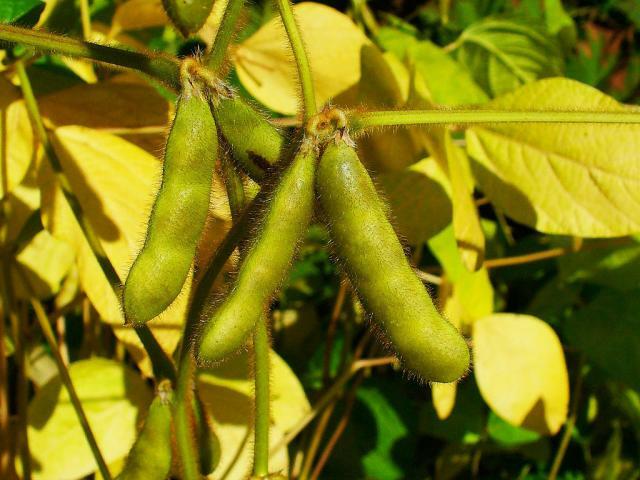 Soybean intended for forage is particularly tolerant to drought (Ecoport, 2010). 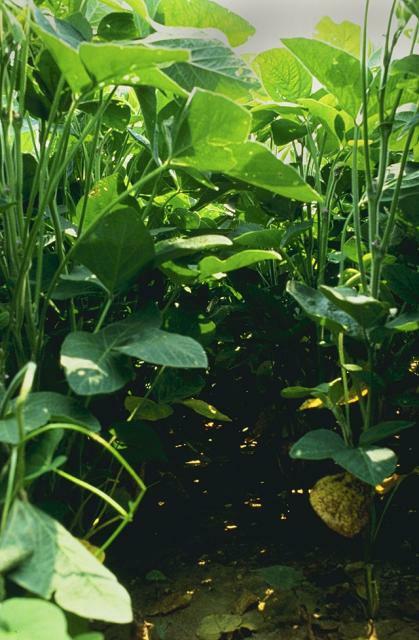 Soybean is a valuable legume forage. Ideally suited for summer cropping, forage soybean is tolerant of drought and thrives when other forage legumes like alfalfa are not available. Forage soybean can be sown alone or in combination with other forage species such as sorghum (Fujita et al., 1990). It should be sown on a well-prepared seedbed once average temperatures are higher than 10°C. It grows quickly and can provide 5 to 10 t DM/ha within 3-4 months (Doo-Hong Min, 2012; Koivisto et al., 2003). Some cultivars developed in the late 20th century are able to produce up to 12 t DM/ha in southern England and up to 18 t/ha in the northern Balkans (Mihailovic et al., 2013; Koivisto et al., 2003). Intercropping forage soybean with maize resulted in the same yield as maize alone but containing 30-43% more protein (Herbert et al., 1984). In a mixed stand of forage soybean and tall fescue, DM yield was threefold and protein increased by 10% (Ocumpaugh et al., 1981). Forage soybean can also be obtained from damaged soybean crops intended for beans, or when economic returns from beans are insufficient (Luginbuhl, 2006). In the USA before the 1950s, it was recommended for annual pastures to combine forage soybeans with maize, sorghum or Sudan grass. For a longer grazing period, several varieties of soybean differing in maturity were sown, or the same variety was sown at different dates (Morse et al., 1952). Soybean plants may be grazed from the flowering stage to near maturity. Late maturing varieties are recommended for grazing (Blount et al., 2013). In the USA, soybean was not considered as a satisfactory pasture for cattle due to the damage caused by trampling to the growing plant, but pasturing sheep on soybean was practiced throughout the Corn Belt (Morse et al., 1952). Soybean can be grazed by goats without problems (Luginbuhl, 2006). Soybean should be control-grazed for up to three days. Goats should be moved before the crop is totally defoliated to ensure regrowth. Under good management, soybean can be grazed three times during the growing season. Soybean can be first grazed when it reaches 60 cm in height when its protein content peaks (Luginbuhl, 2006). Soybean plants may be grazed or harvested from the flowering stage to near maturity for use as high-quality hay (Blount et al., 2013). 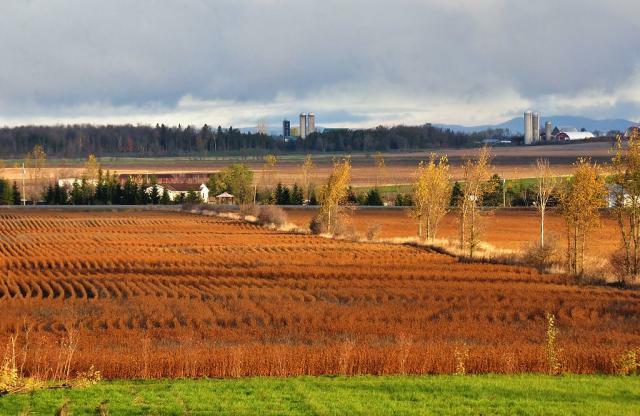 Soybean forage harvested when the leaves begin to turn yellow, but before they begin to fall, is comparable to alfalfa hay harvested at the early bloom stage for protein and fibre content (Brown, 2003). Forage soybean stems are coarse and fibrous, and feeding forage soybean alone may cause digestive troubles. These problems can be alleviated by heavier rates of seeding and by early harvesting. After cutting, the forage should be conditioned (rolled and crushed) so that moisture is readily reduced (Blount et al., 2013; Johnson et al., 1959). A very valuable trait of forage soybean is that it can be harvested for hay at any stage from full bloom to maturity (Blount et al., 2013; Wright, 2013). The hay yield at the full-bloom stage is approximately half that obtained when seeds are between 50 and 75% developed. It can thus be recommended to harvest when the pods are 75% filled (Luginbuhl, 2006). However, soybean hay that contains too high a proportion of beans can result in a diet too high in fat, and cause scouring, depressed appetite and digestive problems (Barnes, 2006 cited by Vargas Bello-Perez, 2007). Soybeans may be grown as a silage crop in a pure stand, or intercropped with maize or sorghum (Blount et al., 2013). If soybean forage is cut at the later stages of maturity, which can happen when grain harvest is compromised by drought, it is recommended to process it into silage to reduce foliage losses (Loy, 1993). It may be useful to wilt soybean forage before ensiling as it prevents the development of Clostridium (Muck et al., 1996). A source of soluble carbohydrates such as molasses or maize grain can be added at 10% (Blount et al., 2013; Wright, 2013). Soybean silage is seldom ensiled alone because of its bitter taste and its high concentration of ammonia and butyric acid (Blount et al., 2013; Gobetti et al., 2011; Göhl, 1982). Soybean forage can produce good quality silage, particularly when mixed with forage sorghums or millets (Mullen, 1999). Soybean and sorghum ensiled together (40:60) with molasses gave a well preserved silage (Lima et al., 2011). The combination of an inoculant (for example Lactobacillus brevis) and molasses were reported to have synergistic effect on soybean silage quality (Tobia et al., 2008; Rigueira et al., 2008). Soybean is an N-fixing legume. It can be used as green manure or as a rotation crop in combination with cotton, maize and sorghum. After etablishment, the rapid growth of soybean helps to reduce weeds. In Africa, it is reported to reduce the parasitic weed Striga hermonthica which is very noxious to crops (Giller et al., 2007). In the wet tropics of Australia, soybean is grown specifically for green manure and to protect fallow paddocks from erosion (DAFF, 2010). Forage soybean may be obtained from both conventional breeding and genetic engineering (Doo-Hong Min, 2012). The debate about the environmental impact of genetically modified crops is complex and a full discussion of the issue is beyond the scope of this datasheet. 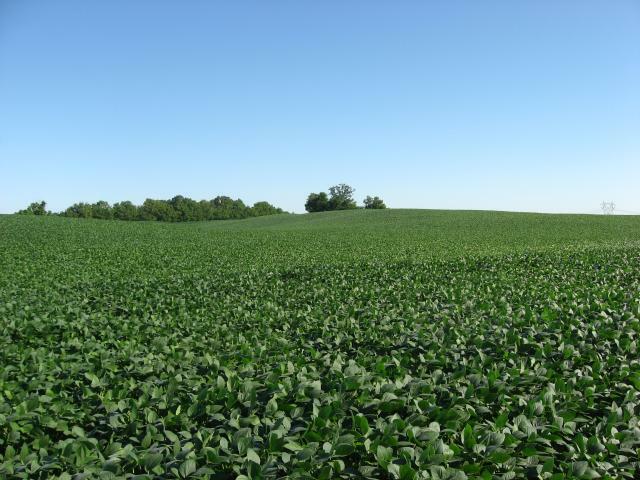 Soybean forage is relatively rich in protein, which varies between 11% and up to more than 22% of the DM. Fibre content is also quite variable, with ADF content ranging from 20% to more than 45% of the DM. It is relatively poor in lignin (about 6% DM). The main factor influencing soybean forage quality is the maturity at harvest. Protein concentration decreases during flowering and increases during pod formation, while fibre concentration changes inversely. The stem and leaf proportion of the plant decreases as the pod and seed components increase. The lipid content of the mature forage can reach 10% of the DM due to the presence of oil in the seeds (Hinz et al., 1992). As a result, soybean forage is at its most nutritive when the beans are allowed to ripen before the crop is grazed or made into hay (Morse et al., 1952; Munoz et al., 1983). The type of cutivar is also important, since late maturing cultivars tend to produce greater forage yields but lower quality forage than early maturing cultivars when harvested at the same stage of development (Hinz et al., 1992). For instance in Australia, the protein content varied from 21 to 23% for an early maturing cultivar between early pod and full-size bean stage, and from 13 to 15% for a late maturing cultivar during the same period (Desborough et al., 1988). It has been recommended to mix varieties at different stages of maturity in the same pasture to secure a longer grazing period (Morse et al., 1952). Hay quality follows the same pattern but leaf and seed loss increases with cutting and curing after mid pod-fill (Desborough et al., 1988). The nutritive value of soybean straw is relatively poor with a protein content ranging from 4 to 12% DM and very high fibre contents (NDF about 80% DM). However, like other legume straws, it is a better roughage than most cereal straws. Like other forage legumes, soybean forage may cause bloat in ruminants (Krantz, 2012). Mature grain crops of soybean damaged by rain should not be grazed by livestock (particularly sheep) or fed to them, because they may be infected with the fungus Phomopsis, which produces toxins that cause symptoms similar to lupinosis (Mullen, 1999). Some herbicides and insecticides have feeding restrictions for soybean harvested for forage (Krantz, 2012). Early trials reported that the use of a high proportion of soybean forage was associated with reproduction problems in female rabbits (Kendall et al., 1950). These issues may have been caused by the presence of phytoestrogenic compounds in soybean forage (Magee et al., 1958). Currently soybean is rarely grazed so there is limited information regarding this utilisation in contemporary livestock farming. Much of the experience on fresh soybean forage was collected in the USA in the first half of the 20th century when it was relatively popular (Morse et al., 1952). In a cow preference study in Australia, cows grazed soybean for a significantly greater time (approximately 70%) than cowpeas (Vigna unguiculata) and lablab (Lablab purpureus) (Horadagoda et al., 2009). Due to its relatively high fibre content, soybean forage is of variable but moderate OM digestibility, comprised between 60 and 70%. In the USA, pasturing cattle on soybean was not recommended because it damages the growing plant. However, mixtures of Sudan grass and soybean were popular as midsummer pastures for dairy cattle (Morse et al., 1952). In a contemporary trial in Australia, dairy cows grazing soybean forage had a higher feed intake than cows grazing kikuyu (Pennisetum clandestinum) pastures. However, due to the lower DM content of soybean pasture, the total DM intake was not different between the two groups of cows, and milk production was not improved by soybean (Clark et al., 2014). Pasturing lambs and breeding ewes on soybean forage used to be a popular practice in the USA, particularly in the Corn Belt (Morse et al., 1952). Soybean silage is a valuable protein source that can be used to replace expensive feeds such as soybean meal in ruminant diets (Gobetti et al., 2011). Ensiled mixtures of maize and soybean silage used to be popular in the USA for feeding dairy cattle (Morse et al., 1952). In a more recent trial, dairy heifers fed on sorghum-soybean silage had a daily gain of 380 g/d, but degraded DM intake and FCR, together with lower nutrient digestibilities values, compared to heifers fed alfalfa hay, oatlage or wet corn gluten feed (Jaster et al., 1984). In Brazil, crossbred (Holstein x Zebu) steers were fed on diets including up to 40% soybean silage as a protein supplement to maize silage and concentrate. Adding an inoculant and/or molasses to the silage increased DM and NDF intake as well as weight gain compared to untreated soybean silages (Rigueira et al., 2008). Nellore steers were fed up to 60% soybean silage and 40% concentrate for 84 days. Soybean silage slightly reduced DM intake (2.09 vs. 2.17 kg/d) and slightly increased average daily gain (1.21 vs. 1.17 kg/d) in comparison to a maize silage diet (Souza et al., 2008). In Japan, a pure soybean silage, included at up to 17% of the diet (DM basis) for sheep, successfully replaced wheat bran in a maize silage-based diet (Touno et al., 2014). In Brazil, soybean silage (60% of the diet DM) supplementing sugarcane tops (20%) and concentrate (20%) in a diet for lambs resulted in a daily weight gain of 133 g/d. Compared with maize silage, soybean silage yielded the highest protein intake, the highest digestiblity of nutrients and resulted in the highest daily weight gain in finishing lambs (Lima et al., 2013). In Cuba, a mixture of 40:60 sorghum and soybean forages yielded a high grade silage with a higher ME than the same mixture before ensiling (11.2 vs. 10.3 MJ/ kg) (Lima et al., 2011). In the USA up to the 1950s, soybean hay used to be widely fed to ruminants, though it was not recommended to feed it alone as it would cause digestive upsets. The presence of woody and coarse stems could make it unpalatable but heavier rates of seeding as well as a timely harvest could alleviate this problem (Baxter et al., 1982; Morse et al., 1952). There have been very few trials concerning soybean hay conducted after the 1950s, in or beyond the USA. In the USA, soybean hay cut before it becomes coarse was considered to be equal to alfalfa and red clover for milk production and for the maintenance of weight in dairy cattle. Hay cut when the pods were completely formed was superior to hay cut at the earlier stages for milk production (Morse et al., 1952). In jersey cows fed isonitrogenous diets containing, as sole forage, soybean hay cut at bloom (protein 14% of DM) or at early pod stage (protein 15% of DM), there were no significant difference in body weight, milk yield or milk fat content (Hubbell et al., 1986). In the USA, soybean hay was found suitable for feeding beef cattle and compared favourably with alfalfa and clover (Morse et al., 1952). In the USA, soybean hay used to be fed to fattening lambs, but only fine hay was suitable for young lambs. Breeding ewes fed only soybean hay performed similarly (lamb weight, ewe weight, health and dairy performance) as ewes fed alfalfa hay (Morse et al., 1952). Soybean straw is considered as a roughage but with a better nutritional value than rice straw. It is suitable for cattle both as fresh and ensiled material. The most practical ways of utilizing soybean straw in dairy cattle feeding systems are as a roughage source supplemented with protein sources or concentrate feeds, or as supplemental roughage. To improve the nutritive value of soybean straw and pods, treating it chemically with urea and spraying it with a urea/molasses solution have been suggested (Sruamsiri, 2007). The palatability of untreated soybean straw is low because of its relatively hard stem (Sruamsiri, 2007). OM digestibility of soybean straw ranges from 42 to 64%. In the USA, soybean straw given without a supplement to weaned beef cattle heifers did not maintain their weight, but when supplemented with maize grain there was a small weight gain of 110 g/d (Bagley et al., 1989). In India, Murrah buffaloes heifers fed soybean straw ad libitum as the sole diet had a daily weight gain of 316 g/d, but supplementation was recommended for better performance (Kumar et al., 1995). Soybean straw fed to growing calves replaced 50% or 100% of sorghum straw in diets with concentrates, supporting the same growth performance (Adangale et al., 2009). In the USA, soybean straw treated with various alkalis had a higher in vitro DM and OM digestibility. Alkali-treated soybean straw fed alone to heifers and steers (202 kg) for 141 days allowed the same daily weight gain as fescue hay (Felix et al., 1993; Felix et al., 1997). DM intake of soybean straw fed alone to sheep ranged from 55.76 g/kg W0.75 (Brazil, Carneiro et al., 1998) to 62.84 g/kg W0.75 (India, Singh et al., 2009). Soybean straw offered as sole feed to growing sheep (India, Singh et al., 2009) or supplemented with 8.5% soybean meal for mature ewes (United States, Gupta et al., 1973) met the maintenance requirements in both cases. Soybean straw offered as sole feed to growing goats met the maintenance requirements (India, Singh et al., 2009). DM intake of soybean straw fed alone ranged from 35.60 g/kg W0.75 (Brazil, Carneiro et al., 1998) to 53.21 g/kg W0.75 (India, Singh et al., 2009). In India, soybean straw fed ad libitum with a concentrate to growing kids led to a higher forage intake and lower concentrate intake compared to sorghum stover (Baswade et al., 2007). In Nigeria, soybean straw included at up to 30% of the DM, replacing maize mill waste, in the diets of growing goats significantly increased DM intake (516 vs. 465 g/d) and daily weight gain (57.8 vs. 34.7 g/d) (Arigbede et al., 2008). In India, a complete diet comprised of 60% soybean straw and 40% concentrate maintained the body weight of 26 kg adult goats (Kale et al., 2009). The same diet allowed a daily weight gain of 48.6 g/d in growing kids (Rajmane et al., 2000). Soybean can be used as a supplementary pasture for pigs. In the USA, it used to be considered as one of the best forage crops for fattening pigs (Morse et al., 1952). Pigs grazing on mature soybean forage should have access to grain, vitamins and minerals, and because of anti-nutritional factors in the raw soybeans pig will not use the dietary protein efficiently. In addition, the oil contained in the beans tends to make the carcass soft (Kephart et al., 2010). In the USA, mature soybean hay used to be fed as a winter feed to pigs (Morse et al., 1952). In the USA, practical experience and feeding trials showed that well-cured soybean hay cut when the pods were 25% to 75% developed made a good winter feed for poultry. Soybean hay could be substituted for alfafa hay in maize-based layer diets. Artificially dried soybean foliage was more nutritious than sun-cured hay because less leaf material was lost (Morse et al., 1952). Fresh or dried soybean forage may be used to feed growing rabbits if included in a balanced diet, with a special attention to phosphorus and to the amino acid content of the diet. In Cuba, soybean forage harvested at the milk stage was used as only feed for growing rabbits (Perez, 1996). 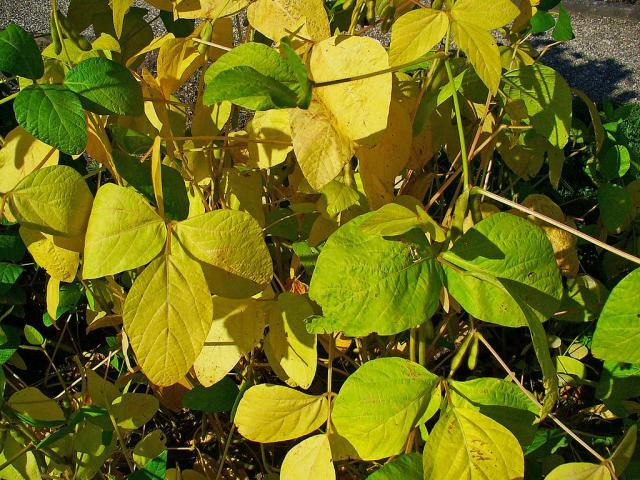 In Nigeria, soybean forage offered with Rhodes grass (Chloris gayana) and a concentrate resulted in significantly lower growth rate (-54%) than groundnut haulms or sweet potato vines (Iyeghe-Erakpotobor, 2007). This poor performance may reflect the low lysine content of soybean forage protein (3.5%, i.e. 70% of the requirements) and sulphur-containing amino acids (2.6%, i.e. 69% of the requirements) (Perez, 1996; Lebas, 2004). A high proportion of soybean forages were shown to cause reproduction troubles in female rabbits (Kendall et al., 1950), possibly due to the presence of phytoestrogenic compounds (Magee et al., 1958) and/or to an insufficient level of phosphorus, both detrimental to rabbit reproduction (Matrone et al., 1954). Past experience and feeding trials in the USA has shown that diets based on soybean hay, maize and oats were satisfactory for work horses. Soybean hay was also a good roughage for growing mules, and, when properly supplemented, equal to alfalfa for growing females to be used as draught animals. However, it was recommended that soybean hay should not make up more than 50% of the roughage (Morse et al., 1952). Horadagoda, A., 2009. What forages do cows prefer if given a choice?. What forages do cows prefer if given a choice?